If you’re looking for a low-maintenance, anti-fatigue sports flooring solution for your workout area, look no further. StayLock is a hassle-free and great looking exercise flooring for a variety of different purposes. Excellent for large or small installations, it can be used in both commercial and residential applications. This multi-purpose flooring can be used in a temporary or permanent capacity. You can place it over any hard surface. You can even lay it down directly over carpeting with no problem! It is easy to keep clean and requires no waxing or finishing which translates to very little maintenance cost. 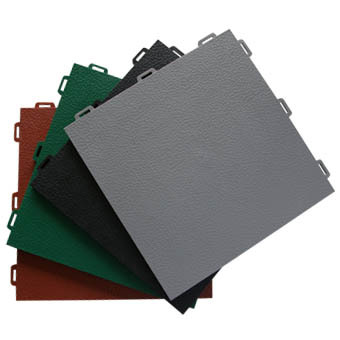 Select this type of modular floor tile for industrial ergonomic flooring, athletic/cardio and aerobic floors, home gyms, basement floors, or anywhere a comfortable and easily installed modular floor tile is needed. This modular flooring features cushion ergonomic benefits to people who have to stand on their feet for long periods of time in industrial, athletic and standing work environments. StayLock flooring tile is easy to connect together using a rubber mallet. Anyone can put these modular floor tiles together. The tiles can easily be taken up or replaced as needed. The typical life span of this type of modular flooring tile is 20 years or more. This ergonomic flooring tile is so easy to assemble because it requires no adhesives or tape to keep it in place. Its unique connection system holds tiles together tightly and perfectly flat to the floor. The connectors are designed to keep the tiles from separating over time and will withstand daily abuse for years to come. Install on any indoor flooring surface including concrete or carpeting. You will get the benefits of superior ergonomic benefits in athetic, laboratory, industrial, or various other locations even without an underlayment. This product is resistant to most acids and oils. Cut StayLock to fit around obstructions. Install in any configuration. All colors are made from virgin PVC material. Black is made from material with a low percentage of recycled content. When the floor tile life span is completed, this material can be reclaimed and reground back into base material that can then be manufactured into useful products, which means this product need never go to the landfill. Tiles are 1×1 foot and 9/16” inch thick. Each tile weighs 1-1/2 lbs. They are waterproof and have border ramps available. These tiles are available in bump top and orange peel surface designs. They come with a seven year warranty. Our new StayLock modular floor tile features either a bump top or orange peel surface design. This floor is great for ergonomic and industrial fatigue flooring, aerobic and exercise floors, or in the home. The tile connection design holds these modular floor tiles together tightly. They will not separate over time. Installation of this waterproof basement floor tile is easy and quick; simply lay the tab side of the tile over the loops and connect the tiles together for a perfect fit every time. No adhesives or tape is required so you are free to disassemble and bring this floor along wherever you go. StayLock floor tiles are easy to connect. Just interlock them and tap with a rubber mallet. Anyone can put these modular floor tiles together. The typical life span of this type of modular flooring tile is 20 years. Choose this modular floor tile for industrial ergonomic flooring, athletic cardio and aerobic floors, home gyms, basement floors, automotive shops, or anywhere a comfortable and easy to install modular floor tile is needed. 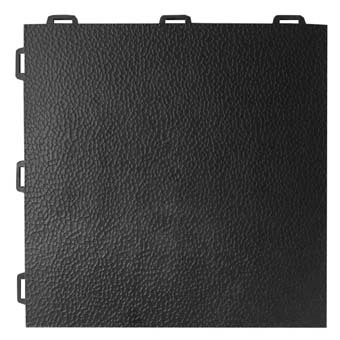 The underside of this modular floor tile features a cushion to provide ergonomic benefits for people who have to stand on their feet for long periods of time. The bump top texture will provide the most ergonomic benefits for industrial and standing work environments while the orange peel will delivers a more aesthetic appeal for commercial and home athletic, gyms, cardio, and aerobic environments. When this floor tile’s lifespan is complete, this material can be reclaimed and reground back into base material that can then be manufactured into useful products. This plastic product need never go to the landfill. All colors are made from virgin PVC material. Black is made from material with a low percentage of recycled content. StayLock floor tiles come in seven standard colors. Custom colors are also available.